Olaparib, a potent oral poly(ADP-ribose) polymerase inhibitor, is partially renally cleared. We investigated the pharmacokinetics and safety of olaparib in patients with mild or moderate renal impairment to provide dosing recommendations. This phase I open-label study assessed the pharmacokinetics, safety and tolerability of single-dose, oral 300-mg olaparib tablets in adults (aged 18–75 years) with solid tumours. Patients had normal renal function, or mild or moderate renal impairment (estimated creatinine clearance ≥ 81, 51–80 or 31–50 mL/min, respectively). Blood was collected for 96 h, and urine samples collected for 24 h post-dose. Patients could continue taking olaparib 300 mg twice daily for a long-term safety assessment. Overall, 44 patients received one or more doses of olaparib and 38 were included in the pharmacokinetic assessment. Patients with mild renal impairment had an area under the curve geometric least-squares mean ratio of 1.24 (90% confidence interval 1.06–1.47) and a geometric least-squares mean maximum plasma concentration ratio of 1.15 (90% confidence interval 1.04–1.27) vs. those with normal renal function. In patients with moderate renal impairment, the geometric least-squares mean ratio for the area under the curve was 1.44 (90% confidence interval 1.10–1.89) and for the maximum plasma concentration was 1.26 (90% confidence interval 1.06–1.48) vs. those with normal renal function. No new safety signals were detected in patients with mild or moderate renal impairment. In patients with mild renal impairment, the small increase in exposure to olaparib was not considered clinically relevant. In patients with moderate renal impairment, exposure to olaparib increased by 44%; thus, these patients should be carefully monitored and the tablet dose should be adjusted to 200 mg twice daily. The authors thank the patients, their families, and all investigators and study personnel involved. Ruth Plummer and L. Rhoda Molife acknowledge that The Royal Marsden Hospital and Northern Centre of Cancer Care are funded by Cancer Research UK and the Department of Health (England) as Experimental Cancer Medicine Centres. Medical writing assistance was provided by Kristin Luehders PhD and Claire Routley PhD from Mudskipper Business Ltd, funded by AstraZeneca and Merck Sharp & Dohme Corp., a subsidiary of Merck & Co., Inc., Kenilworth, NJ, USA (MSD). All authors were involved in the obtaining, analysis and/or interpretation of data, drafting of the manuscript, critical revisions of the manuscript for important intellectual content, and approval of the final version. This study was sponsored by AstraZeneca and is part of an alliance between AstraZeneca and MSD. AstraZeneca was involved in the study design, data collection, data analysis and data interpretation. MSD also provided input into data interpretation. Medical writing support was funded by AstraZeneca and MSD. Christian Rolfo has received research grants from OncoDNA and consulting fees/honorarium from Mylan, and has participated in speaker bureaus for MSD, Novartis and Guardant Health. Judith de Vos-Geelen, Nicolas Isambert, L. Rhoda Molife, Peter Grundtvig-Sørensen, Karin Leunen, Ruth Plummer, Luc Dirix and Alain Ravaud have no conflicts of interest that are directly relevant to the content of this article. Jan H.M. Schellens is employed by and holds stock in Modra Pharmaceuticals, has a patent with oral taxanes and has a consultancy with Debiopharm. Morten Mau-Sørensen has received a research grant from AstraZeneca. Jacques De Grève has received a research grant from AstraZeneca, has attended advisory boards for AstraZeneca and is a board member of the AstraZeneca Foundation in Belgium. Guy Jerusalem has received research grants from Roche and Novartis, and consulting fees/honorarium from Novartis, Celgene, Roche, Amgen, Pfizer, Bristol-Myers Squibb, Lilly, Puma Biotech, AstraZeneca, Daiichi Sankyo and AbbVie. Maria Learoyd and Anitra Fielding are employees of, and hold stock in AstraZeneca. Wendy Bannister is a contractor for AstraZeneca. Data underlying the findings described in this article may be obtained in accordance with AstraZeneca’s data sharing policy described at: https://astrazenecagrouptrials.pharmacm.com/ST/Submission/Disclosure. European Medicines Agency. Lynparza summary of product characteristics. 2014. http://www.ema.europa.eu/docs/en_GB/document_library/EPAR_-_Product_Information/human/003726/WC500180151.pdf. Accessed 03 Jul 2018. US FDA. Lynparza (olaparib) capsules, for oral use: initial US approval. 2014. https://www.accessdata.fda.gov/drugsatfda_docs/label/2017/206162s008lbl.pdf. Accessed 05 Dec 2018. US FDA. Lynparza (olaparib) tablets, for oral use. Prescribing information. 2018. https://www.accessdata.fda.gov/drugsatfda_docs/label/2018/208558s001lbl.pdf. Accessed 05 Dec 2018. European Medicines Agency. CHMP assessment report on extension of marketing authorisation grouped with a variation: Lynparza. 2018. http://www.ema.europa.eu/docs/en_GB/document_library/EPAR_-_Assessment_Report_-_Variation/human/003726/WC500249582.pdf. Accessed 05 Dec 2018. European Medicines Agency. Guideline on the evaluation of the pharmacokinetics of medicinal products in patients with decreased renal function. 2015. http://www.ema.europa.eu/docs/en_GB/document_library/Scientific_guideline/2016/02/WC500200841.pdf. Accessed 05 Dec 2018. European Medicines Agency. 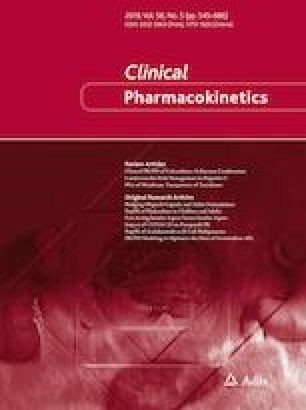 Guideline on the evaluation of the pharmacokinetics of medicinal products in patients with decreased renal function. 2014. http://www.ema.europa.eu/docs/en_GB/document_library/Scientific_guideline/2014/02/WC500162133.pdf. Accessed 05 Dec 2018.